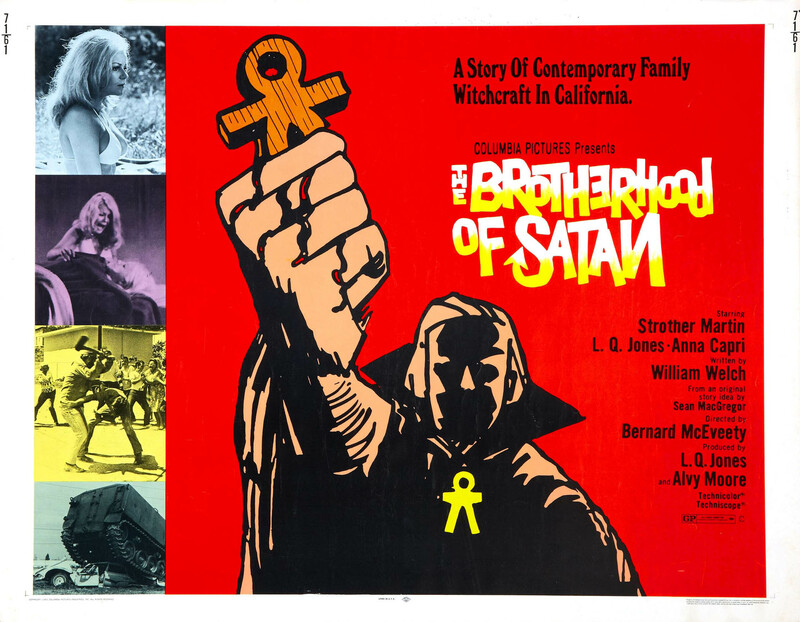 The Brotherhood of Satan Review (1971). Satan Comes to a Sleepy Town to Steal Children… – Stigmatophilia's gore splattered corner of insanity. In the wake of Roman Polanski’s seminal Rosemary’s Baby there was a surge of ‘witchcraft/ satanist’ movies to come out of the late 60’s early 70’s, not all were good, take my last review for Virgin Witch for example, but some were actually quite interesting. I have always liked a good witchy story in horror I think there is plenty of scope for far out elements to be added and Brotherhood of Satan is one such movie. I must admit I had never heard of it before I set about trolling though the Wikipedia lists of early 70’s horror movies for something I hadn’t seen before. I really try to avoid reviews before I have seen a film but in my quest to find out more about this title and whether it would be worth checking out or not I inadvertently picked up on a few opinion comments which seem divided. Some people consider this an underrated gem while others are not so complementary. Personally I found the film very enjoyable and unexpected, not going into it with any expectations. Touted as a B movie on most internet sources this was better than average, and the acting none too shoddy when compared to other budget offerings. Directed by Bernard McEveety (who apart from this usually worked in TV) and written, produced and acted in by another TV staple L.Q Jones means that while this film is not up there with some of the genre greats it was fairly well made for something targeted at the then thriving drive-in market. Ben, his girlfriend Nicky and young daughter from his previous relationship K.T are travelling to California for a visit with family when they come across a car crash and go to report it at a local small town Hillsboro. The townspeople are noticeably on edge and it transpires that strange events have been happening, a number of children have gone missing, people are dying in odd circumstances, and the residents cannot leave. Ben and his family soon discover they are stuck in Hillsboro too and about to be exposed to the horror which resides there. The story gets stuck into the action straight from the starting line, and there are a few twists and turns but nothing that gets too complicated to follow. It is predictable at times, and there are some dragging scenes but some of the stand out set pieces make up for it. The standard of acting here is reasonably good, but then a large percentage of the cast have extensive experience in TV work and some in other film work. There are not really any stand out performances however but the cast members come over as fairly naturalistic and there is not much of the awkwardness that you usually see in B movies which is refreshing. Charles Bateman portrays Ben as the usual square jawed all American type. Ahna Capri fairs slightly better as girlfriend Nicky (better known in her role in Enter the Dragon), but then she had an extensive history in acting being a former child actress. Strother Martin as Doc Martin is probably the most experienced cast member having acted in numerous films including Cool Hand Luke (1967) , but comes over as a little camp at times. I cannot go into any detail without ruining the plot, but in some of his key scenes he comes over as a little weak. L.Q Jones (who also co wrote and produced this venture) plays the sheriff as if he is in a Western but then that is where most of his experience comes from and therefore is to be expected to some degree. Charles Robinson as the priest was slightly unconvincing given his age, the character would have probably been more suited to an older actor. Not that you can really expect much from children, the kids in this film really do let the side down, with ‘acting’ which ranges from wooden to slightly melodramatic. This flaw does little to impact on the overall effect however given that the standard as I have already mentioned rises above B movie expectation. One thing that surprised me about this film was the quality of the print, shot in widescreen and remastered for Blu-ray it looked really good. The colours were vivid and crisp, the sound quality excellent, with no blurring, scratching or bad dubbing you would think it had a much bigger budget than it actually did. There were some nice set pieces in this film as well and to talk about them in any detail will give away the story which I am reluctant to do, however one scene in particular which takes the form of a surreal dreamscape stood out for me. There is a kids party scene which I found to be both beautifully filmed and carried a dark magic in its content. Also worth mentioning is one of the final sets in this movie was particularly epic and would not have looked out of place in a black metal music video. Atmosphere builds nicely in some parts with the help of an overactive fog machine, and I did enjoy these moments, which were cheesy and cliqued but still great to watch. There is not a lot of gore in this film (although there is some), but then it does not really need it to be effective. Overall this is one of those movies that will provide an entertaining afternoon if you are stuck for something to watch. It may not be a genre classic but is fun if you do not go into it with too many expectations. Half decent performances and some great set pieces along with an interesting story mean that it fairs a lot better than some of its less well made, trashier, low budget counterparts. ‹ Our Tribute to the Lovely Vampire Ladies of 60’s & 70’s cinema.